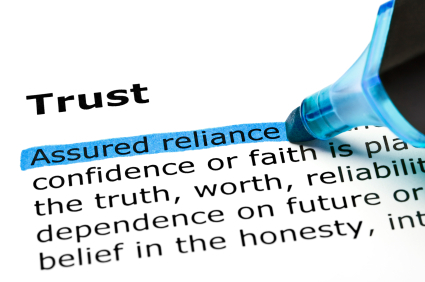 Trust has been a big theme for several clients, friends and myself over the past couple of weeks. Not trusting life or the people in it to provide what we need. Not trusting ourselves to choose the right path or people to partner with in that pursuit. This common theme about trust seems to be provoking a lot of anger, a sign that the overwhelming sense of powerlessness to change unwanted circumstances is finally bubbling to the surface, ready to be released. The truth is, we all deserve a better relationship with trust. But it can't be developed only through getting what we want all the time. Because what we want in the moment isn't always the path to what we've been asking for from life. The truth is, it may be time to change the way we quantify how life is working out for us. In my life, I've found that many of my setbacks have just as much value and purpose as my successes. Do you know what I mean? What if it's time to change our concept of 'trust' altogether? What if trust means believing that things happen for a reason and there is divine timing at play in everything? Might seem too altruistic for some, but if you and I were to embrace the idea that divine timing is at play, then things must unfold in a sequence that is often outside of our realm of perception. Think of the gears in a clock. For the clock to move forward, all the gears have to interlock in succession, one by one coming together to make the next forward move possible. Life is like that. We can't always see the gears ahead that are coming together when we're looking back at all the gears breaking apart. I turned 35 this year and had a reading with our family astrologer, Dale O'Brien. (Literally, Dale has been doing readings for me since I was 10 years old.) Dale said that this year in particular is a guardian angel year. What that means, is when things align it's for the greater good, and when things don't align it's a saving grace. Can you think of times in your life when you pushed past the resistance of thinking things weren't working out only to find that they got better when you choose not to shut down and give up hope? Funny enough, that very thing happened to me the other day. I planned to meet a dear friend for a hike and on the way there, she texted saying there was a traffic jam and we needed to meet somewhere else in order to give her time to hike before her next meeting. I suggested a new spot and she instantly agreed, remembering a recent dream about this place because of an off-beaten path to a man-made wishing box. She'd been thinking about that wishing box and wanting to go, but just never suggested it. Feeling that our last minute change of plans was kismet, we excitedly arrived at the entrance to the path only to find a construction fence was surrounding it. For a split second, my friend was disappointed, but something in her said onward, and we went a different route. Shortly thereafter, when we'd made peace with the disappointment, we discovered an unexpected shortcut to the original path. Thrilled at our luck, we went hiking up the steep hill in search of the wishing box, like excited little girls. Our conversation became alive with transformative stories about inner process and current life experiences. However, the longer we walked, my friend began to realize that the wishing box was not in the place she remembered. We looked around and even asked people if they knew where it was, but no one knew what we were talking about. Finally, we agreed again to give up the plan and choose to move onward without finding the wishing box. Instead of being disappionted that the value in our hike didn't come from finding the box, we eventually realized that value in our hike came from the conversation generated on the way to finding the wishing box. Does that make sense? The pursuit of the thing that inspired us is what produced the profound experience, not the outcome. My friend demonstrated for me that fear and distrust towards her 'guidance' for not leading her to what she was hoping to find, was not the path, but rather, we realized that life had our back regardless. We found that by pushing past our resistance, we discovered a new route that is perhaps better. Learning to trust that life has our back, setbacks included, is a major reframe we all need to make. It's much easier to see the story of life disappointing us, rather than to believe our blocks and hardships have more to do with making space for what we more deeply desire, by guiding us away from where we're no longer meant to be. Our job, if we actually want to achieve a successful outcome to our long-term dreams and desires, is to trust that what shows up is part of the plan instead of in opposition to the plan. Katherine Woodward Thomas (Calling In The One, Conscious Uncoupling) is really the one who taught me how to stop being afraid when things fall apart. When it happens, we're actually not in an outcome stage, we're in a transformation stage. In order to get to stage where the outcome we want can occurs, it begins with the desecration of the old structures, jobs, partners, friends and relationships that no longer serve the new desire we are aligning with for ourselves. Hardships are like the acts of a play. Our problems occur in act 1 or act 2 but the resolution occurs in act 3. As the great Film Director Orson Wells once said, "If you want a happy ending, that depends, of course, on where you stop your story." Or in my case, a hike.